Wimbledon 2017 – the most famous tennis championship in the world – is over. While Britain’s Andy Murray will be nursing himself back to fitness after the injury which cost him the trophy, in London SW12 one armchair tennis fan must also regroup. Two weeks of cheering for Muller, Konta and Radwanska from my sofa and consequently fewer walks and more ice creams have taken their toll. But now it’s over and for Andy and me, it’s time to get inspired and back to our routines. Step 1: hop on the scales and assess the damage – two or three pounds more than I’d like. Step 2: reinstate the food diary. 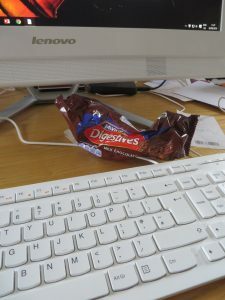 Keeping track of what you eat makes you aware of every mouthful whether consumed at the desk, sofa or worktop. No need to count calories, just keep a record and it will shout for itself. savour food and fine wine as two of life’s great pleasures but practise moderation. get a pair of flat comfy shoes and walk whenever you can. if you work in hospitality, food and wine – Guiliano was once CEO of Veuve Cliquot – you don’t have to match your fellow drinkers glass for glass. You don’t even have to finish your glass. No one will notice. cut back for a few days after a period of overeating and under-exercising. See above. This came out in 1988 and the low fat approach – as also championed by Rosemary Conley – is somewhat outdated. Never mind. Forget the word diet and ignore the menus. What I like is that the author is a doctor and he reminds you of the health implications of carrying too much weight. There’s an excellent chapter 6 on motivation and preparation which suggests you set down your reasons for wanting to shift a few pounds e.g. ‘I want to ease the pain of arthritis in my knees’. Finally, I love the honesty. 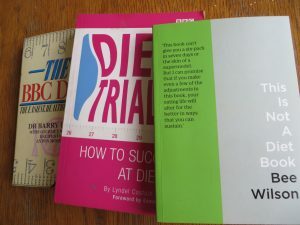 Dr Lynch includes his own food diary in the book and shows us that he cheated yet still lost weight. You don’t have to be perfect; just make small changes. Again, don’t let the words diet and dieting in the title put you off. Turn straight to Step 4 of Section 2 entitled Getting your head straight about food and weight. It’s worth getting this book for this section alone. There is some excellent material about the emotional reasons we overeat and why we should learn ‘flexible restraint’. It’s possible that the British National Health Service (NHS) would be better off helping people to tackle the emotional reasons they comfort and binge-eat rather than telling them to eat more vegetables and take more exercise. Most people know what they should be eating but it’s easier said than done. Have you had a period of less exercise and more nervy comfort-eating than usual? Perhaps you’ve been looking after an elderly parent or revising for exams. What helped you get back to normal?